While my scholarly, hyper-astute film criticism here at Stand By For Mind Control has garnered me massive accolades worldwide, my actual job is being a rapper. I’m home from performing in the 10th annual official Nerdcore showcase at Austin’s South By Southwest Music Festival, and since that’s also a film festival, I will tell you about the movies I saw. Well, bless director Tony Avellone’s heart. He set out to weave an epic tale of Bill Murray’s various uninvited cameos among our everyday lives: crashing wedding photos, wandering into college parties, bartending, buying you a beer. 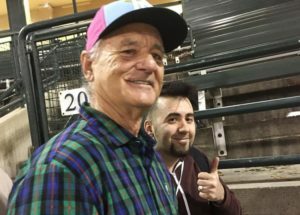 What Avellone wove instead is the same story over and over: someone wasn’t expecting to meet Bill Murray, but did, and is still kind of starstruck over it. Rinse, repeat. The intended climax, an interview with Murray for the film, never culminates. Avallone settles for a photo together while speedwalking. The Bill Murray Stories: Life Lessons Learned From a Mythical Man excerpts at one point a youtube series wherein a fan cooks dinner for Bill Murray every week, then talks about how Bill didn’t show up to dinner again. The food gets cold, but the running gag of the rejected invitation seems more compelling than this documentary’s genuine disappointments. 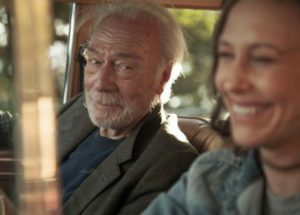 Shana Feste’s road trip dramedy about a frazzled mom (Vera Farmiga), her artistic (but slightly school-shootery) son, and her free-wheelin’, dope-dealin’ pappy (Christopher Plummer) has more than a little charm. The performances are rich, the jokes are funny, the pathos is ripe. But the real fascination here is the wild disconnect between the movie’s breezy tone and its darkly vicious innards. Behold the travails of single mother Laura who is surrounded by men who lie to her, manipulate her, force her into increasingly compromising situations and monumental legal jeopardy, all while winking and giggling among themselves. It is a gender-dystopic nightmare scenario on par with Neil LaBute’s most misanthropic compositions. Yet it is paced, played, and presented like a heartwarming Hallmark Channel romp. I could barely get my head around it. Also, I was pretty high. I picked up The Coup frontman Boots Riley’s script for Sorry To Bother You when McSweeney’s published it in paperback in 2014. It was a fantastic read, surreal, hilarious, brilliant, and a bit grim. I assumed that quirky little chapbook would be its final form, because it was too much like a fever dream to film cheaply and too much a piece of socialist agit-prop to receive studio financing. Well, paint me bright wrong! Boots found the money, cobbled together the perfect cast, and directed it himself. There are a few seams showing, lags and missing pieces you might attribute to a modest budget or a first time director, but much more noticeable are the overall cohesion, the staggering imaginative originality, and the feats of derring-do both political and artistic. This thing is a triumph. It’ll be big deal when it comes out in early July. Get in line for it now. The Space Western is not an entirely unexpected genre mashup (one of my favorite movies is The American Astronaut (2005), an indie-rock Space Western Musical). The cross-pollination might even verge on predictable if you’re a fan of Firefly (2002-2003) and Serenity (2005), Trigun (1998), Outland (1981), or even Star Wars (1977). But most of these take from Westerns only the most obvious adventure elements: the reluctant gunslinger defending ranchers, or the band of outlaws finding fortune while gallivanting across the wild frontier. Prospect is different. It fully inhabits both its genres at once, and each with a welcome seriousness. Like the noir detective high-school drama Brick (2005), its dialogue is painstakingly crafted to the old-timey spec while its setting and visuals are impeccably modern (or in this case, futuristic). In Prospect, the far reaches of nature’s landscape are wide open, untapped, hostile to human life, and claustrophobically lonesome. There are no white or black hats, just humans who have ventured out past the far extremes of civilization, crossing paths without trust, trying to do for themselves under overwhelming stress, digging some treasure out of the dirt and hoping to keep it without getting shot. The technology that makes this culture possible (in Westerns, the saddle and the sidearm, in space the rocket and the oxygen tank) are work tools — there is none of the flash or cleanliness of current Sci-Fi, no holograms, no antigrav. Every helmet looks like it was acquired from a different artisan on some different outpost. Any machine might fail and strand you, out here so far from help. The story is tense and beautiful and small. The acting is superb. Everything about this movie works. Keep an eye out. Finally saw Sorry to Bother You. I think it suffered greatly from being the second half of a double-bill with BlacKkKlansman — which is an amazingly strong film. This one… cute in parts. Clever in parts. Fresh, frequently. But meaningful? Coherent? I don’t really think so. There’s an idea in there that doesn’t quite congeal. I love Lakeith Stanfield, but he just sort of stumbles through this. And then the whole premise of ‘acting/talking white’ doesn’t take off — mainly because if you’re going to hold up the whole ‘white voice = power/confidence” thing, the LAST TWO PEOPLE’s voices you’d use are David Cross’ and Patton Oswalt’s. It’s just a boggling bit of miscasting. Big(ish) names, sure, but if anyone out there can honestly say they’ve ever wanted to talk like either man, I’ll eat my hat, your hat, and Tessa Thompson’s earrings. I can’t say I liked it, even though I wanted to. Okay. Good. So I’m not the only one. There’s a lot of nutty imagination in there, and some very funny bits, but it all has the feel of just throwing everything against the wall and hoping some stuff sticks. Some does. A bunch, not so much. It also suffers from a lot of the jokes being stepped on by the editing.